From their beginnings, Quakers have been actively involved in social justice and reform. Such activities have drawn many of us to this faith community and in Bristol, Friends – as we call ourselves – are involved in prison reform, in resolving conflict non-violently, in outreach with homeless people, campaigning against the arms trade, green issues and many other causes. But funnily enough, silence is at the centre of what we call a meeting for worship, from which we draw our fellowship and strength. We sit round in a circle for an hour and wait to be moved to speak. Some of us believe in God and follow the example and teachings of Jesus of Nazareth and would say God’s Spirit inspires us to speak and act, or indeed, to listen and wait. Others – people who don’t feel easy about Christian religious language for example – would put it differently, but we share this sitting and waiting, even if we’re very broad minded when it comes to beliefs. One thing almost all of us believe is that everyone has the ‘inner light’ within them. It’s a question of showing it or finding it. It’s a belief that gives us hope and compassion. So we welcome people who are seeking; a sense of inner peace, of fellowship with fellow travellers; people with questions or a yearning for meaning that the consumer world doesn’t offer. • seeking peace and working for reconciliation and looking after our environment. We’re not saints – far from it – but we try to live out these values in our everyday lives. We like to see ourselves as non-materialistic people who talk straight, are practical, who value community, are suspicious of rules, bosses and hierarchy and we like to run our own affairs. We’re volunteers who share the running of the business side that comes with any organisation which owns buildings and deals with money, much of it given away. And the business is also conducted in as calm and worshipful a manner as possible and, like any group, we have our differences. 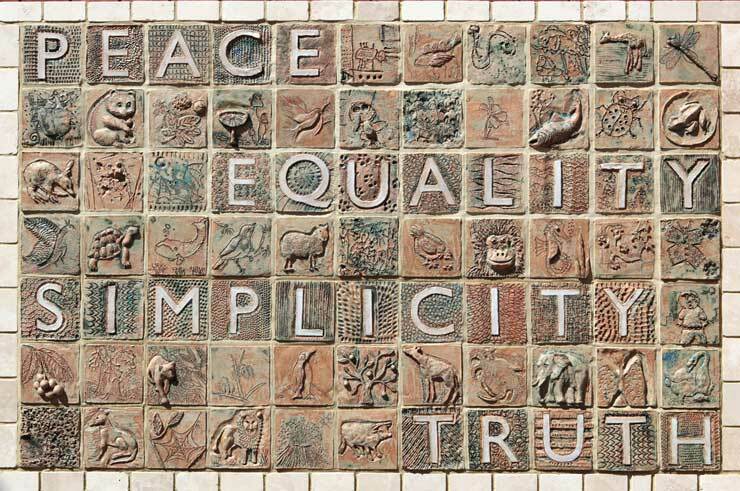 Quaker Week website – A special site for those who wish to find out more about Quakers. Young Friends General Meeting National organisation for Quakers (18 – 30yrs) in Britain. YFGM organises a number of events that enable young Friends from around Britain to get together for social and spiritual gatherings. Woodbrook Quaker Study Centre Woodbrooke is the Quaker Study Centre in the UK. It is based in the former family home of the local chocolate maker, George Cadbury, himself a Quaker, and has, since 1903, provided education for those of any faith or none from around the world. Swarthmoor Hall The Quaker historic house and retreat at Ulverston which is the birthplace of Quakerism. Quaker Schools Website dedicated to the seven Quaker schools in England. Web space for young Quakers What it says on the tin! Place for Quakers under eighteen. Quaker Action on Alcohol and Drugs (QAAD) works in accordance with Quaker principles to address the widespread use and misuse of alcohol, prescribed and illegal drugs and gambling. There are seven meetings in and around Bristol. Some are small, some large and they all share the same way of worship. The Meetings are at Thornbury, Portishead, Central (St Jude’s), Redland, Horfield, Bedminster and Frenchay. There was a time when we were outwardly quiet, grey and reserved about communicating. We’re more confident now and think we have a powerful, warm and motivating way of life to offer, and always plenty to learn from those who attend and engage with us. You are most welcome. History of Bristol Quakers A short account of Quakers in Bristol.